» Bacterial production and respiration data set for NSF Arctic Photochemistry project on the North Slope of Alaska. 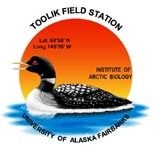 The detailed bacterial production protocol is found at http://www-personal.umich.edu/~gwk (click on the protocol link at the bottom of the page), or at the NSF Arctic LTER website under the Landscape Interactions main page at http://ecosystems.mbl.edu/ARC/landwater/landwaterdefault.html. Bacterial production (Bac Prod) is determined by the incorporation of 14C labeled Leucine (Simon and Azam 1989) in triplicate water samples incubated in the dark at in situ temperature for 2 hours. Water samples are vacuum filtered through 0.22 um Millipore GS cellulose nitrate filters. Samples are extracted with 5mL of 5% TCA for 5 minutes, rinsed with additional TCA, and air dried in mini-scintillation vials. Following the addition of 1 mL cellosolve (ethylene glycol monoethyl ether), filters are left to dissolve overnight. Scinti-safe scintillation cocktail (4 mL) is then added to each vial and samples are counted on a liquid scintillation counter (Packard Tri-Carb 2100TR or equivalent). Calculations of bacterial productivity assume that the Internal Dilution (ID) of leucine is 1, but studies show it may range from 1-2 (Kirchman 1993). Some published data from these LTER files have used an ID value different than 1; in those studies, the ID value used is stated in the publication. Bacterial respiration (Bac Resp) is determined by measuring oxygen change over time in sealed exetainer vials on a membrane inlet mass spectrometer (MIMS). Rates of respiration (oxygen consumption) are calculated by comparing to an initial control sample. Incubation times range from 3-8 days, during which samples are held at constant temperature in the dark. Details are provided in Cory et al. (2013). In this dataset, "In Situ" Bacterial Production is measured by collecting sample water and incubating at the water temperature where collected, or at 7 deg C, for 2 hrs in triplicate vials and a killed control. In this dataset, "In Situ" Bacterial Respiration is measured by collecting sample water and incubating at the water temperature where collected, or at 7 deg C, for 3-8 days in triplicate or quadruplicate vials, then measuring oxygen change (compared to an initial control sample) on a MIMS as described above. In this dataset, Light or Dark Bacterial Production and Light or Dark Bacterial Respiration (production and respiration as described above) were measured on water incubated in the "Light" or in the "Dark". These Light and Dark treatments were prepared by first filtering sample water through Whatman GF/F filters and photoexposing the "Light" samples for ~12 hrs, while keeping the "Dark" controls wrapped in foil and dark. After photoexposure, water is filtered through 0.2 μm Sterivex filters and inoculated with bacteria in GF/C filtered water from the original sample site. Samples are incubated in the dark at 7 deg C for 3-8 days, after which the bacterial production or bacterial respiration is assayed as described above. 1. Simon, M., and F. Azam. 1989. Protein content and protein synthesis rates of planktonic marine bacteria. Marine Ecology Progress Series 51:201-213.2. Kirchman, D.L. 1993. Leucine incorporation as a measure of biomass production by heterotrophic bacteria. Pages 509-512 in P.F. Kemp, B.F. Sherr, E.B. Sherr, and J.J. Cole, editors. Handbook of methods in aquatic microbial ecology. Lewis Publishers, Boca Raton, Florida, USA. 3. Cory, R.M, B.C. Crump, J.A. Dobkowski, and G.W. Kling. 2013. Surface exposure to sunlight stimulates CO2 release from permafrost soil carbon in the Arctic. PNAS 110:3429-3434. Definition: Site Name. Lake and stream sites use common names (e.g., "Toolik") or ARC LTER number codes. If a soil site, the site is described first by general location then by specific feature (e.g., watertrack) then by specific sampling point (1,2,3,...). Exceptions in naming procedure are provided in the Code Information and in the AK-LTER_Site_Info.xls file.